​Lana did an amazing job for me - very responsive and easy to work with. I appreciated her professionalism and dedication to my home search. I would absolutely recommend her! Lana is great. She's very helpful, kind, and fun to work with. She is very knowledgeable and helped me find a great house for me and my daughter. If I ever need to buy a house again I will definitely have Lana help. Lana made buying our first home and easy and pleasant experience. She listened to what we were looking for and didn’t take up any unnecessary time. In fact, we purchased the first house we looked at! Lana made scheduling inspections and signing documents as easy as possible as well, communicating effectively with all parties, working around our busy schedules, and making it possible to electronically sign many of the required documents. We appreciated Lana’s knowledge of the market, her efficiency, and her professionalism. Thank you for listening and for finding us the home that is perfect for our family! Even though I was not certain what I was looking for, Lana listened to me and found the perfect parcel of land. She even took into consideration that, because I live in Arizona, I would not necessarily be aware of the issues with the weather in Montana. For instance, she suggested that I find a place with a reasonably level driveway and close to a county-maintained main road for those Montana winters. She has since double-checked to make sure that the corners of the parcel have been properly marked and has updated me on other issues regarding the property. I would highly recommend Lana for any of your real estate needs. ​This was my first home purchase as a single parent and Lana was amazing to work with. She was helpful and was always available to answer my questions. The entire process was smooth. I would definitely recommend her if you are in the market for a new home! 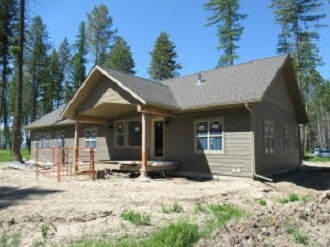 We purchased a single family home in Columbia Falls, Mt. We worked with Lana who put up with us (and our son who lives in MT) for over a year in finding the right property for us. We're in Florida and couldn't have done it without her.